Christmas Potluck – Come One, Come All! 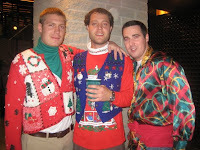 You know that ugly Christmas sweater you have tucked away in a drawer somewhere? Well it’s time to pull it out cause we’re having a party!! This potluck will take place this Sunday (December 20). And in the hopes that more of you will be able to make it, we’ll be starting a little earlier than usual – at 4pm. 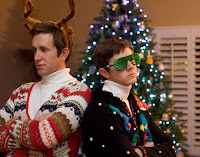 For you folks who don’t currently own ugly Christmas garb, you can always make you’re own. We’ll try to supply some pom poms and puff paint just in case you feel like getting creative. 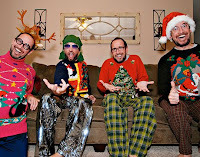 And if you think you’ll be attending multiple occasions like this, maybe you want to invest in a handmade sweater from this site: http://www.myuglychristmassweater.com. 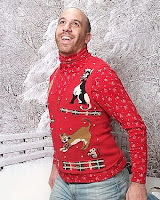 The Obama Christmas Sweater is quite cool. Oh – and in addition to delicious food to stuff your face with, expect there to be some dancing involved! Anyway, we hope to see you all there!